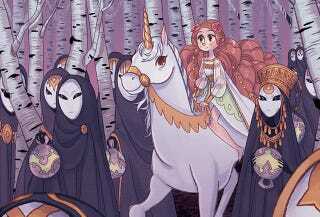 Kadi Fedoruk’s webcomic Blindsprings is a lushly illustrated princess tale with a twist. A young mage decides to rescue a princess from the curse that keeps her bound to a mystical forest. But there’s a hitch: this princess doesn’t want to be rescued. At first glance, Tamaura seems like a princess straight out of a Disney movie. She wanders about her forest home in regal gowns, enjoying the company of the local fauna. But it quickly becomes clear that there is something more, something perhaps darker to her situation. One day, she meets Harris, a young man who recognizes her from a fable, and they become friends—and least until Harris leaves for mage school. Years later, Harris returns, with new magical skills and an obsession with “rescuing” the magical girl in the forest. But for Tamaura, such a rescue means disaster, and Harris’ actions plunge her into an industrial world that is completely alien to her. It also gives her a new mission, one that will likely make Harris her enemy. This is a story of a fairytale character thrust into a more modern world, and while it is enchanting, it’s not Enchanted. Fedouk isn’t looking to spoof the tropes of Disney-style princess media; instead, she is pulling strands from Disney movies as well as fairytales, Studio Ghibli films, and other sources and weaving them into her own tale with its own opportunities. This is a story in which an innocent childhood romance results in a grave error in judgment, in which our heroine might come to resent her curse even as she resents the person who tried to free her, in which a girl who may be centuries old may make friends for the first time ever, in which we can delight in the wonders of the modern world while still admiring the awesome power of nature. Fedouk has managed to set this up in just a few dozen pages, lending her comic a feel that is both mythic and modern. Plus, it’s just plain gorgeous. If Blindsprings were ever to become an animated movie, you can bet I’d be first in line.